How to solve the silliness and dodgy sexual politics of Mozart and De Ponte’s comic opera? Director Phelim McDermott’s answer is to embrace and subvert both at the same time, while gleefully transplanting the whole thing to the fairground. 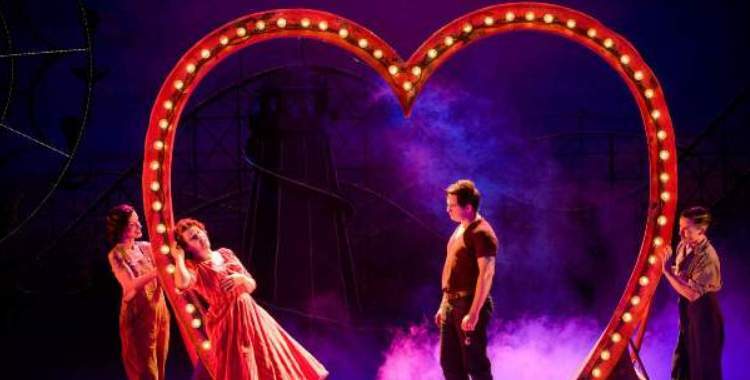 In this new ENO production, created in partnership with Improbable, the two pairs of lovers are vacationing in 1950s Coney Island, surrounded by the vivid swirl of the carnival. In this environment, where nothing is quite as it appears, it hardly seems surprising that the two men would reappear to their beloveds in the guise of teddy boys in the plot’s central test of fidelity. Here, the usual rules are suspended and all bets are off. This colourful framework established, the concept allows McDermott and his creative team to riff playfully on their theme, balancing invention upon invention. From its joyfully witty curtain-raiser onwards, this Così Fan Tutte is a dazzling sideshow of visual ingenuity. Tom Pye’s stunning design, complemented by beautifully evocative lighting from Paule Constable, is every bit as enchanting as Mozart’s music – all brilliant colour, twinkling fairy lights and dramatic sunsets. McDermott’s direction has fun with the pliable playground that Pye has created, finding cheeky solutions to the story’s subtext. The lovers bounce euphemistically on carousel horses, while the revolving chambers of the motel where sisters Fiordiligi and Dorabella are staying hint mischievously at the women’s fickle passions. The performers, too, inject an infectious sense of fun into Da Ponte’s story of love, confusion and deceit – none more so than Mary Bevan, whose sparkling Despina is deliciously manipulative in her nudging of the two women being cruelly tricked by their fiancés. Christine Rice’s spirited Dorabella is wonderfully unapologetic in the swift transferral of her desire, while Fiordiligi’s eventual submission to her feelings is made all the more affecting by the journey that Kate Valentine takes us on. The men lag behind both vocally and in the vividness of their characterisations, although Marcus Farnsworth and Randall Bills both attack the seduction sequences with energy and brio, and it’s a neat touch to have Roderick Williams’ charismatic Don Alfonso as the scheming ringmaster of the ensemble of circus performers. But it’s not all about the fun of the fair. Beneath the amusement and allure, there is a grubby underside to the Coney Island setting, offering a necessary counterpoint to the candyfloss silliness of the plot. There’s an uncomfortable sleaziness sitting under the opening scene between Don Alfonso and the officers, hinting lightly at the misogyny implied in the opera’s central wager. Improbable’s skills ensemble, meanwhile, provide a brilliant visual commentary on events from their hovering presence in the background of scenes. As Fiordiligi and Dorabella expressively grieve and swoon, stall-tenders roll their eyes and chew gum; the saccharine romance of the seduction scenes is offset by sword swallowing and bearded women. The function of this constant undercutting is to question the normalised wooing and manipulation deployed by Guglielmo and Ferrando and prevent the main thrust of the plot, which is gorgeously funny in this telling, from becoming a mere harmless comedy of disguises. There is certainly an emphasis on the lighter, more amusing aspects of the opera in McDermott’s production, enhanced by the sparkling wit of Jeremy Sams’ English translation, but the use of contrast also points up the ridiculousness and cruelty of the central plot device. In the fairground workers and sideshow performers, we find a foil and an alternative. And the fairground itself, like one of Shakespeare’s forests, acts as a liminal, magical space – an arena in which anything can happen. Just as we delight in the surface humour and beauty of McDermott’s production, we might relish the escape that this space can offer, but grey, complicated reality always waits just around the corner.